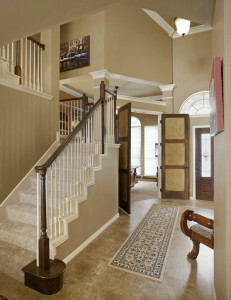 Staircases are often the literal center of the home and are a feature used by everyone. Staircases in homes are used to take family pictures, hang holiday decorations and most importantly as a way to get the second floor of your home. Staircases are integral piece of your home and while they should be functional, they can be fashionable as well. The staircase is one of the first things people may see upon entering your home, and they have an opportunity to make a good first impression on your guests. Large grand staircases give a sense of stateliness and make a bold presence in your home. Whether you choose to use dark or light trim, grand staircases make statement in your home all on their own. If space is an issue and there is not enough room for a grand staircase, a spiral staircase is a great option. Spiral staircases take up very little room, are functional and aesthetically pleasing. Spiral staircases can be put in the corner of a room to take you from one floor to another and is a great solution for connecting a refurbished space. Stairs are an essential part of any multi-level home and which staircase you choose will depend on your style.